Gold market was quiet yesterday due to Martin Luther King Jr. Day. 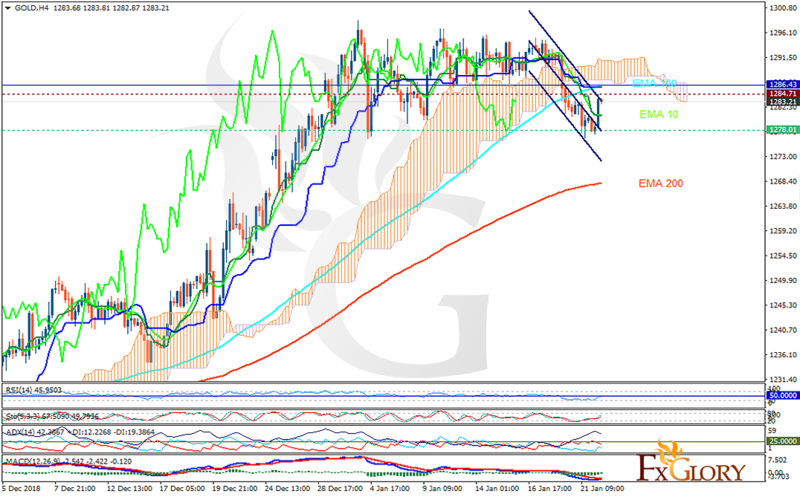 The support rests at 1278.01 with resistance at 1284.71 which both lines are below the weekly pivot point at 1286.43. The EMA of 10 is moving with bearish bias in the descendant channel and it is above the EMA of 200 and below the EMA of 100. The RSI is moving on the 50 level, the Stochastic is showing upward momentum and the MACD line is below the signal line in the negative territory. The ADX is showing weak sell signal. The price is below the Ichimoku Cloud and the Chinkou Span. The Tenkan-sen and the Kijun-sen are both showing a horizontal trend. The indicators are showing mixed signals, the resistance level breakout may push the price up towards 1290; otherwise, short positions are recommended towards 1270.